A number of cruisers received emails this week informing them that their upcoming Royal Caribbean cruise stop at Perfect Day at CocoCay has been cancelled due to a "minor delay". Over the past two days, we have received reports from Royal Caribbean guests that certain upcoming sailings towards the very end of 2018 or beginning of 2019 have had their port call in CocoCay cancelled and replaced with a stop in Miami, Florida. 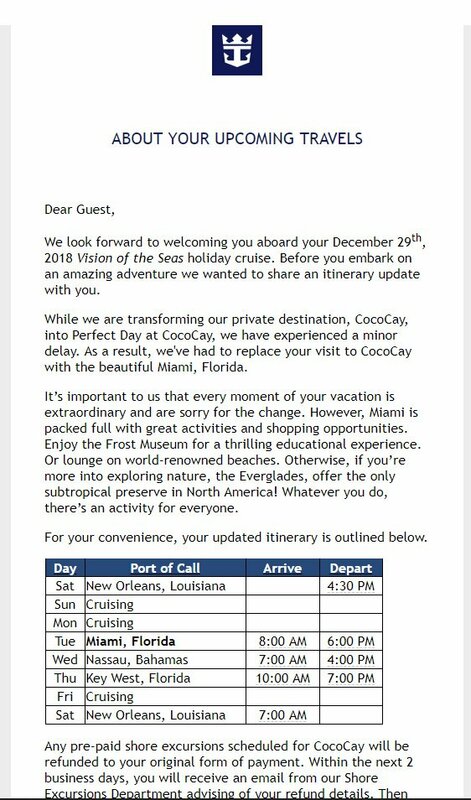 The email explains that work to convert CocoCay to Perfect Day at CocoCay is the reason, "While we are transforming our private destination, CocoCay, into Perfect Day at CocoCay, we have experienced a minor delay. As a result, we've had to replace your visit to CocoCay with the beautiful Miami, Florida." 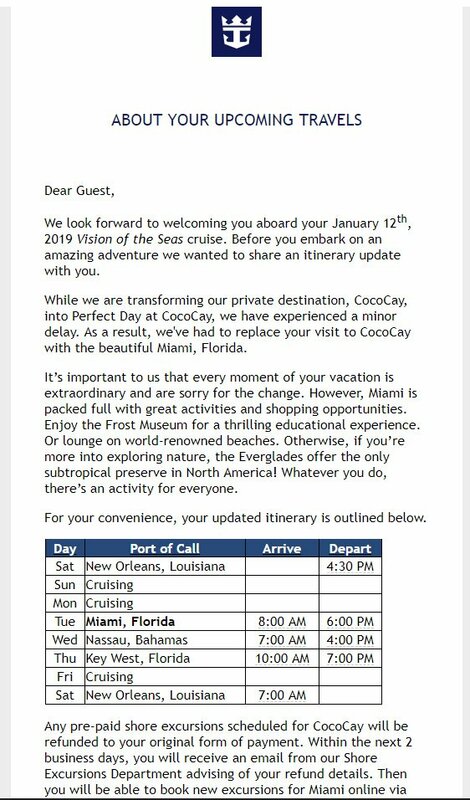 Thus far, we have received reports just of sailings going to CocoCay in late December 2018 and early January 2019 and all on Vision of the Seas. Any pre-paid shore excursions scheduled for CocoCay will be refunded to the original form of payment. Perfect Day at CocoCay is a $200 million upgrade to Royal Caribbean's private island in the Bahamas and is scheduled to open in phases that will last into the end of 2019.